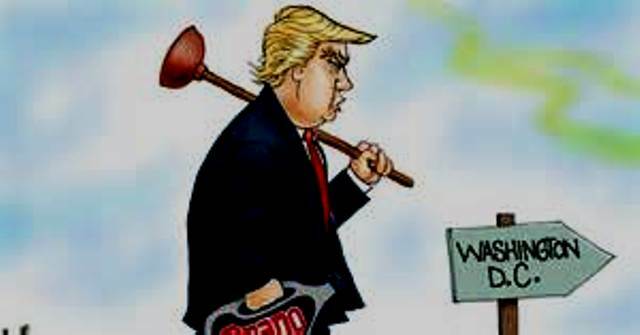 The Washington Cesspool is Now Totally Dysfunctional and Combative! The “Washington Cesspool” is huge! It includes the Democrats, RINO Republicans, Main Stream Media, self-appointed members of the “Washington Elite”, most of the Washington career bureaucrats, and many federal employees. In fact the “Cesspool” has become so big it literally drowns out any one outside the cesspool who attempts to “call out” any of its members for anything they do or question anything any of its members says. Tom Fitton, President of “Judicial Watch” calls it the “Deep State” and describes it as “legions of political appointees, career civil servants, and powerful private contractors who run the government no matter who is in the Oval Office. No matter which political party controls Congress. And, no matter what is the will of the American people. No matter who is in power they exert control. Oftentimes the liberal media effectively operates as the propaganda arm for the “Deep State”. Regardless of what you call it, the “Swamp”, “Washington Cesspool”, or “Deep State” it is obvious that its inhabitants are becoming more obsessed with destroying the Trump Presidency by any means necessary! Nancy Pelosi publicly threatened to shut the Federal government down if President Trump continues to insist that a border wall be part of immigration reform. Senator Schumer immediately agreed with her. Practically all of Obama’s political appointees were “rubber stamped” immediately by the Democrats and RINO Republicans in the senate. But after nine months in office President Trump still has many unfilled positions, even with a Republican majority in the senate! Republican Senator Bob Corker made very demeaning public statements about President Trump. Congress is spending millions of dollars and thousands of hours keeping the alleged Russian Trump campaign collusion investigation going, with the Main Stream Media’s eager assistance. Democrats and RINO Republicans continue to hold hearings and press conferences about this even though there has not been any actual evidence of Russian meddling in the election uncovered. This continues to happen while they have much more pressing issues like tax reform, the Federal budget, immigration reform, and Obamacare that really need to be worked on. Congressman Al Green is planning to introduce legislation, with co-sponsors, to impeach President Trump. Clinton and Obama “holdovers” in every government agency continue to violate laws, including acts of treason, on a daily basis in an organized effort to sabotage the Trump Presidency. Tom Fitton calls these people the “Obama Shadow Government”. Many of these people were actively involved in ILLEGALLY spying on the Trump Campaign and illegally releasing selected bits of information. INITIALLY THIS WAS A CAREFULLY COORDINATED EFFORT TO TRY AND INFLUENCE THE ELECTION. After the election they continued to spy on the Trump Transition Team and then the new Trump Presidency and illegally release bits of information in an ongoing effort to destroy the Trump Presidency. As noted these are just a few examples of how far the “Never Trumpers” are willing to go to destroy the Trump Presidency. These people must be “called out” as the traitors that they are, and where ever possible replaced with patriotic Americans! The “Cesspool” has been growing steadily for decades so draining it is going to be a long slow process. However, I am confident that President Trump, Attorney General Sessions and the President’s Cabinet Secretaries will steadily chip away at it over time. A Racist and a Homophobe Walk into a Bar...NFL’s Black Players made 'Slaves,' Denied Constitutional Rights?